A lovely little commission for a gorgeous wee lass. 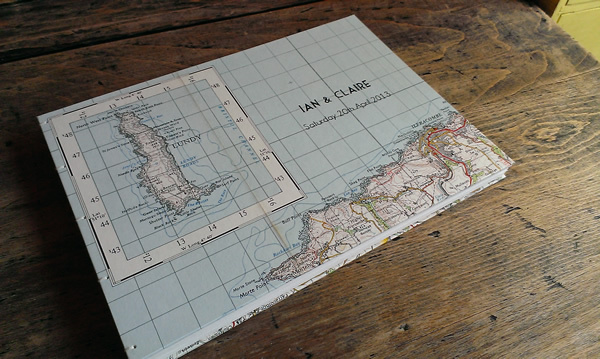 The covers are made using an old ordnance survey map of the Barnstaple area – with Lundy Island given pride of place, as that’s where the couple got engaged. 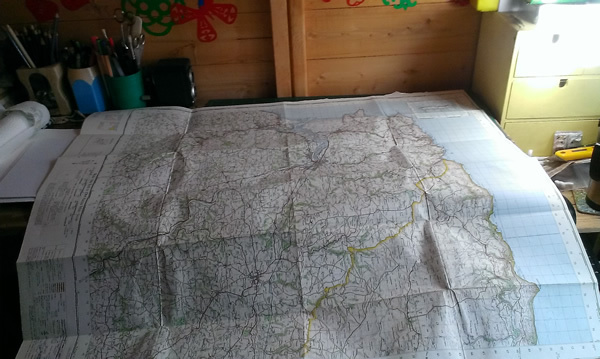 …yeah, I did struggle a bit there, but got there in the end and the finished result was well worth the swearing! The names of the bride and groom, together with the wedding date, were added to the front of the book by hand (imitating the fonts which were used on the invitations). 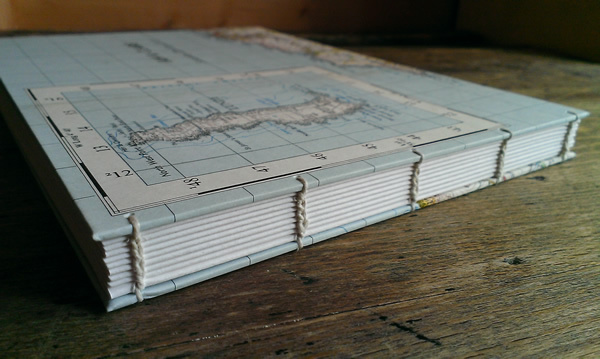 The book measures approximately 21cm x 15cm, and contains 36 pages (72 sides) of 220gsm cartridge paper; the coptic binding has been done using 100% linen thread. 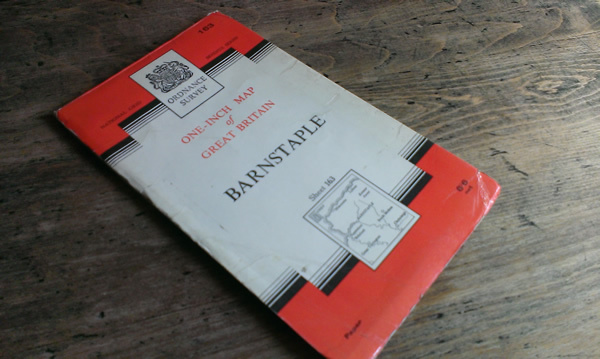 I still have quite a lot of the map left over, so there may yet be a second installment to this post! absolutely beautiful. 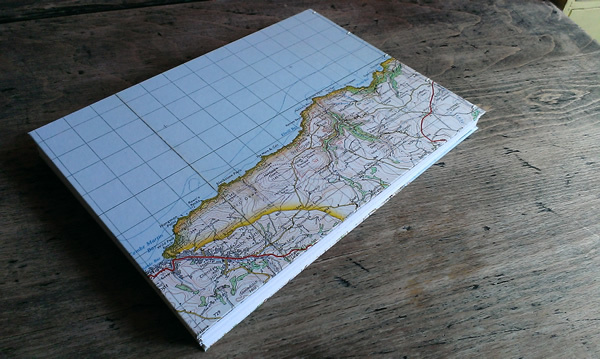 i use maps in my line of work and have repurposed them for wrapping paper and cards….but your project is spectacular! Yay! When looking for a guestbook Emma was the obvious choice – in fact I have no idea why it took me so long to engage my brain and get in touch! Maps feature throughout our invitations, save the dates, etc, simply because we love them – we have several framed on our walls at home. 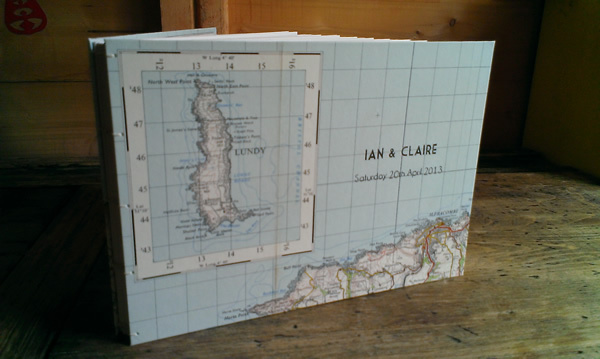 Lundy is an incredibly special place and is even more so now that it will forever be the place we got engaged. 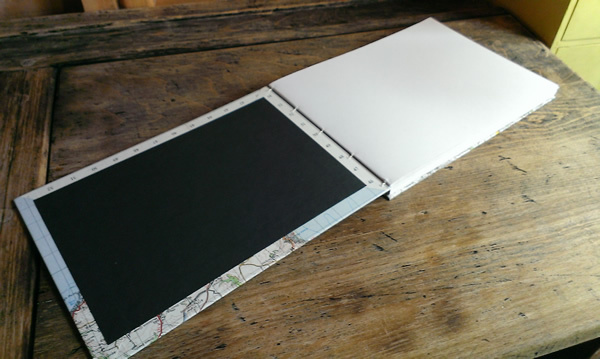 Emma was so helpful with sizing, number of pages, suggestions for colours of binding thread and inside covers etc and the whole process was an absolute delight and very speedy too. This book will look wonderful on the bookshelf once it’s filled with handwriting after our wedding in April. To anyone considering asking Emma to make a guestbook or indeed any other book for them, do so!